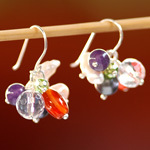 This pair of earrings is from jewelry artisan Phat Tangmo. 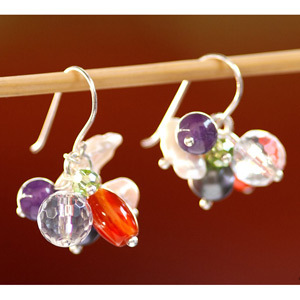 She crafts the earrings by hand with pearls, rock crystal, carnelian and amethyst. She hangs the design from sterling silver hooks. This pair of earrings may vary slightly in colors, weight and size. Natural stone - slight variations and small defects in the stones are to be expected. Color discrepancies may occur between this item and your computer screen. Materials: Cultured freshwater pearls, rock crystal, carnelian, amethyst and sterling silver (.925). This gemstone jewelry was designed and handcrafted by Phat Tangmo. She grew up in an environment of beauty created by her mother. Following in her mother's footsteps, she started creating jewelry by the age of seven. 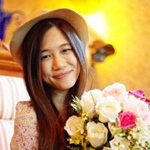 She loves playing music, dancing, dressing in local northern Thai costume and speaking the local dialect and many other things. The inspiration for her designs comes from her imagination and the beauty of things around her. She feels lucky to be around so many attractive elements that she can absorb, adapt and express in her jewelry designs, which change according to her emotions. ... Read Phat's full biography on Ezistock Blog.